Take a Trip to the Islands -- Right Here in Traverse City! There are things that once impressed me with their size and power that seem sadly diminished when I&apos;ve returned to them years later. South Manitou Island is not one of them. When you get right down to it, there&apos;s magic in an island. Maybe it&apos;s all those fantasies of buried treasure, or that atmosphere of romantic isolation, but stepping off the boat onto an unknown shore - even when you&apos;re only a mile from the mainland -- is always a bit of a thrill. There are all kinds of islands in the Traverse City area, and almost all of them are public parks that you can roam to your heart&apos;s content. Some are so large that they take days to explore; some are so small they can be enjoyed for an hour. But if you&apos;ve never been an "islander" before, this is the perfect place to give it a try! 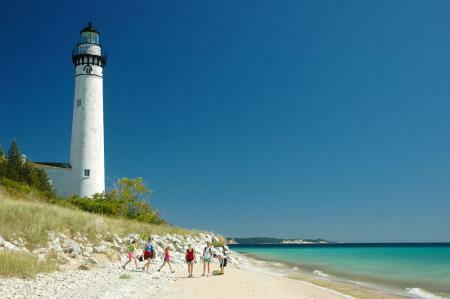 The most famous islands in the region are North and South Manitou Islands, which are in Lake Michigan and part of the Sleeping Bear Dunes National Lakeshore. Like most of the big islands in the region, they were once densely inhabited - but today the remains of their homes, barns, cemeteries and even items of farming equipment are being reclaimed by the wilderness. There aren&apos;t a lot of amenities on the north island -- unless you count empty beaches, tall dunes, mysterious ruins and forests so deep they feel like something from Jurassic Park. But if you&apos;re prepared to carry all your worldly possessions on your back for several days, the payoff comes in real true-life adventure. 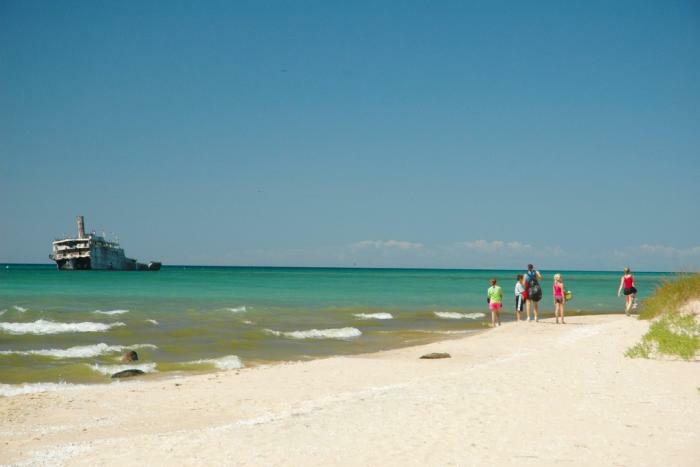 A much less intense island experience can be had on Power Island, a 204-acre preserve of forests, wetlands, bluffs and beaches on West Grand Traverse Bay, within sight of downtown Traverse City. It&apos;s a county park whose only human residents are the ranger and his family who stay in the summers to keep an eye on things. 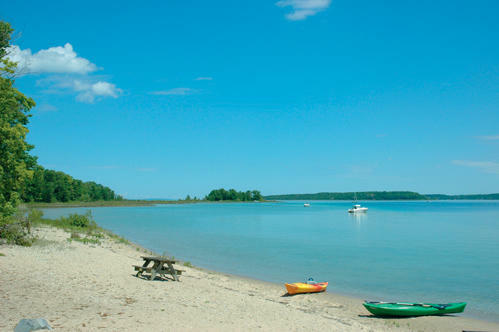 But for boaters and paddlers, it&apos;s one of the most popular destinations on the bay, thanks to its sheltered location at Bowers Harbor off the Old Mission Peninsula. On summer weekends, in particular, its tiny harbor is filled with boats and frolicking boaters who congregate around the dock and swimming beach, or cluster in the shallows off its southern edge to enjoy the limpid Caribbean-clear waters and picnic on the tree-shaded beaches. Solitary souls can find tranquility here even on the busiest days, since most visitors never venture more than a few yards from the water&apos;s edge. The interior is a treat for hikers: miles of well-maintained trails lead through the dense forest to a high ridge known as the Eagle&apos;s Nest and along the wild western shore with its steep bluffs and rocky shoals. To the north, there&apos;s another, smaller islet: little 2-acre Bassett Island, which in low-water periods is linked to its larger neighbor by a causeway of sand, gravel and boulders. Here, the county maintains a small five-site rustic campground. It&apos;s a strange experience to camp out on a "desert island" so close to the mainland that you can watch the lights of the homes and restaurants that line the opposite shore. Until recently the two islands have been accessible only to boat owners, but a new breed of excursion operators are bringing casual visitors out for tours in sea kayaks. Kayakers who prefer to keep their own schedules can bring or rent boats, too. Not all of the region&apos;s island parks are on the Big Water, either; several inland lakes around Traverse City boast islands of their own. Long Lake, a popular recreational center just west of Traverse City, has several island parks - Fox Island, Long Island, South Island and Picnic Island. The most accessible is 13-acre South Island, which has a nice hiking trail, but 10-acre Fox Island is heavily forested and is a great place to spot bald eagles.